A pretty good trial movie that really gets great and twisty in its final act. Witness For The Prosecution isn’t really anything special until it’s end, but it’s still a worthwhile bit of fun the whole way through. That’s because Charles Laughton, playing the lawyer, Sir Wilfred, is hysterical. He delivers all the wise cracks and insults a cranky older man should. And they are pretty much all directed at his nurse and butler. The movie might be about a serious trial, but its got comedy weaved in all over the place. The trial at hand is about a man who is being accused of murder. That man, Leonard Vole, played by Tyrone Power, had been spending a lot of time with a wealthy older woman. He’s married to a beautiful wife who he helped take out of Germany to escape the Nazis, but he’s hangs out with this older woman for very specific reasons. She has money and he’s an inventor. She likes him and he hopes that this can somehow translate into her giving him some money or sponsoring him with making some inventions. But the woman is killed and Leonard vole is the number one suspect. He insists that he was fond of her and would have no reason to ever kill her. That seems like it will work well for his case, that he had no motive, until the woman’s will turns up and says that Leonard is to receive a large sum of money in the event of her death. Now he finds himself on the chopping block even more. Part of the fun of this movie is watching how Wilfred slowly progresses to taking Leonard’s case. Wilfred has just come back from the hospital at the start of the film, and he’s in no position to do anything that might be aggravating to his health. That of course, includes taking on any court cases. And so for a while he respects his doctor’s orders and helps Leonard find another lawyer. Wilfred listens in to the conversations with the other lawyer and asks Leonard questions. he also listens to the questions the other lawyer is asking him and he doesn’t like the way this lawyer seems to be planning his case. the case is certainly a challenge, and wilfred cherishes the opportunity to do something that might be fun, simply because it will take his unique ability to orchestrate a winning argument. and so he agrees to take on the case, despite everyone else pleading with him to let it go. in one of my favorite moments, he receives some bad news about his case that takes things from ugly to horrid, from light to serious. up until now, wilfred has been hiding that he was smoking from his nurse, but when he gets the bad news, he takes out a cigar and throws it in his mouth. then he orders his nurse to give him a light. when she tries to object, he yells at her, repeating his orders, and she gives him the light he wants. i love this moment because it shows that the fun and games are over. things have just gotten serious and wilfred can no longer spend his energy and attention on trying to hide things from the nurse. it’s one of those, stop kidding around and strap up moments, where wilfred knows this case is going to need him to be at the top of his game. the trial begins, and both sides seem evenly matched for a while. then comes the prosecution’s star witness, leonard’s wife, christine. she has some testimony that is so unexpected, and so much the opposite of what we were anticipating that it becomes the first big twist of the movie, at about halfway in. it’s warmup compared with what’s coming down the line, but it gets us back on our toes, in case we were starting to drift. then there’s another surprise witness. this one just shows up out of the blue and calls Wilfred up with some incriminating evidence. this mysterious stranger is quickly embraced by wilfred, who seems to be running a losing case. He’ll take anything to help keep his case alive and put doubt into the juries minds. If Leonard’s wife was the witness for the prosecution, this this woman, and not leonard himself, is the star witness for the defense. leonard takes the stand, no doubt, to defend himself, but he doesn’t have any evidence or new arguments to offer. In the final portion of the movie, the twists start to really unfold. one after another, like the ending of the movie wild things, they just land right on top of each other. and they work because they are all very strong. especially christine justifies her actions by mentioning something that Wilfred told her at the start of the picture. things get shaken up in all kinds of ways and it all happens within the last ten minutes of the film. 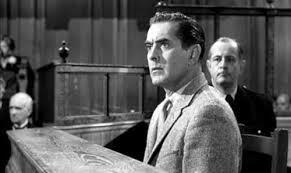 Witness For The Prosecution is a good movie, but it only gets great in it’s final minutes. it’s a trial movie, but the highlights come after the trial has ended. there’s no question, a twisty final act like this inspired such classic moments as the end surprise in Primal Fear with edward norton’s colors coming out. but here, it’s something different. It’s not just one twist but several. And up until this point, the movie was still pretty good. It worked as a comedy and it’s trial story was interesting and kept our attention. 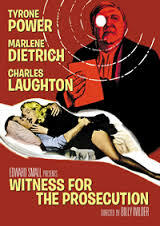 witness for the prosecution is a good movie with a terrific ending.